I was doing laundry on my day off and it reminded me of a couple nifty life hacks I came up with a few years back to save yourself tons of time on ironing clothes and stress on your back. This is a really simple point but one overlooked by many people I see at the laundromat, have your clothes in something with wheels. I personally use my wheeled luggage that I take on airplanes, it’s conveniently the right size for a load of laundry and it prevents me from having to have a cart just for laundry. This bag is also water proof enough to protect my laundry from the rain. 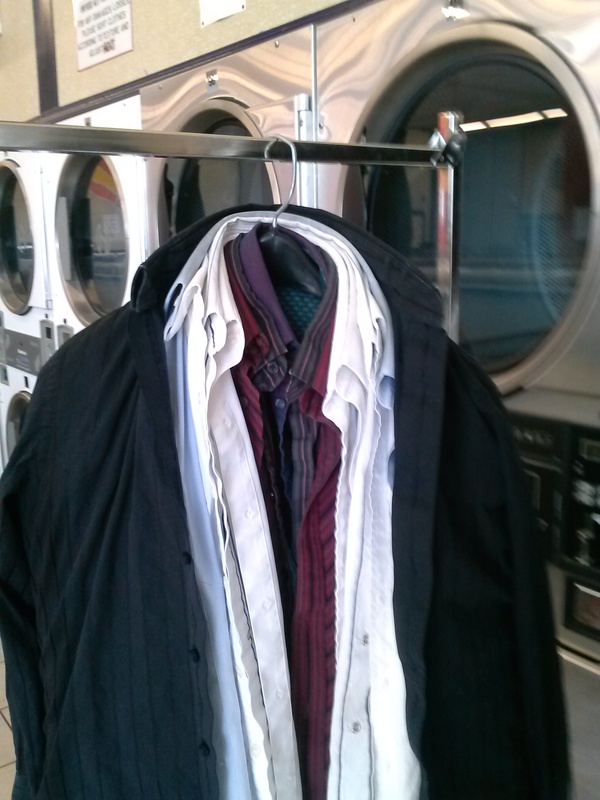 The second lifehack is to bring a heavy-duty jacket coat hanger with you to hang up easily wrinkled clothes. Instead of stuffing dress shirts into a bag only to have to iron them when you get home just hang them up. It helps to hang up the smallest in size first and layer to the largest, you can fit about a dozen on one hanger before it becomes unwieldy.